Nottingham based accountant, Jamie Selby, has always held high aspirations in business. After progressing from Junior to Partner in a handful of years, he forged ahead, looking for a new challenge and decided to take the leap and start his own forward-thinking accountancy practice based in West Bridgford, Nottingham. Jamie tells us more about his unique business and its start-up journey. Could you tell us a little about your business and your USP? 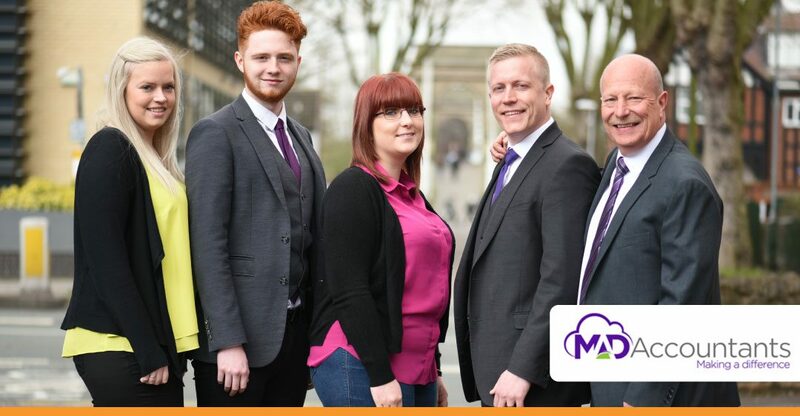 My business is called MAD Accountants Making A Difference, we currently employ 5 people and we are based in West Bridgford, Nottingham. We currently help businesses outsource their finance function. We help them stay on top of the finances and rest assured that all the compliance is dealt with. We really care about our clients and it is our dream to make a difference in the world by helping small businesses succeed. We utilize technology to help automate a lot of the mundane tasks that business owners do. I started my working life like most teenagers: I didn’t have a clue! I did what most would do and turned to my parents who helped me start looking in the right places. They told me to do something I enjoyed, something I’m good at. Sounds easy right? I spent the next month thinking what was I good at? What did I enjoy? I used to play football to high standard at South Notts, but I also enjoyed electronics, woodwork, and science. I particularly enjoyed business studies, and like most teenagers used to dream of becoming a millionaire! This led me to college to do a Business Studies GNVQ advanced. I liked the diversity of the course, which covered all aspects of business. It was here I also learned that I didn’t want to go to University, as I couldn’t see myself studying for another 3 years and I didn’t fancy all that debt. Around this time, I found an advert in the newspaper for an accounting apprenticeship at Babington. At college I’d achieved 97% in my accounting modules, and was even tutoring my fellow students. At Babington I would get paid while I studied, and would be doing something I excelled in. Within a couple of days I had an interview with the college, and after that I had an interview with Mazars, the company I would be working for whilst I studied. I turned up for the first interview extremely nervous, but upon researching the company I knew I wanted to work with them, and that spurred me on. I received a call asking me back for a second interview, and at the time I didn’t even know about second interviews, but I thought this must be a good sign. At the second interview I was asked where I wanted to be in the future, to which I replied, “I want to be a partner”. They asked what starting salary I would expect, and I said “£30,000”, which prompted laughs! I feel that the manager liked my drive and determination, and he offered me the job on the spot. I was at Mazars for 7 years where I completed my AAT and my ACA (ICAEW), and I progressed well after starting life as a Junior and moving up to Senior. I was the first Junior at Mazars to bring additional work into the business! I felt that I wanted to continue moving up, so I decided it was time to leave and I joined a small firm called EMTACS where I was offered partnership after only 3 years. Geoff was an amazing boss and was inspirational to me in my time at EMTACS. It was here that I was at a cross road. I really wanted to become partner, but I wanted more control of the business and was keen to start integrating technology. But it was clear that this was not going to be an option as it was a big investment. This is when I decided to go at it on my own and my first business SelbyJones was born! SelbyJones was very successful but it became more like a job to me, rather than a business. I soon realised the errors in my ways. I had become a solopreneur, and the business was so dependent on me. I gave away a lot for free, things got very complicated and I was losing my way. When my son, Tobias, was born late November of 2015 everything changed for me. Suddenly it was no longer about me and my wife, I had another mouth to feed and I needed to be at home to support my wife and spend time with my child. I found the next 9 months a massive struggle to get through, to the point where I was going to give up, sell my business and get a job as this was the worst job in the world, that of a business owner. It was August 2016 and I got speaking with my father who had recently been made redundant and I saw this as a huge opportunity to get help, financial help in the business, which in turn would free up my time and give me the ability to bring on a chartered accountant to help. This was a turning point for my business and we have had a tough 12 months to September 2017, but I can finally say I am free of a job and I am now a business owner. We have an ambitious future and I truthfully want to make a difference in the world, I have an idea as to how I am going to do that and that is to help small businesses succeed and make a positive difference in the world by linking with B1G1. If all goes to plan, we can leverage our giving and could potentially end water starvation in the world, as well as helping with access to education for all. My business now has a purpose, and that is not to produce a profit but to Make A Difference, and this is why we did the rebrand to MAD Accountants Making A Difference. This has been an amazing journey for me so far, but truthfully it is only just beginning. How did you find out about the support on offer from NBV? I heard about NBV through my wife, we were looking at trying to access grant funding and that is where I was introduced to my NBV Advisor David Hallam and informed of the support we could access. David was able to point out a lot of support that was available to small businesses, that I just would not have been aware of had I not met him. We accessed grant funding for our website and equipment, this was a total of about £2000 worth of funding which was awesome. We are also on the mentoring programme with David, which has been great to just get me working on the business instead of in it. It has been great to just have someone to lean on when things are getting a bit cloudy. Most of the funding and skills I have been given access to have been through David. Recently David has put us in contact with Nottingham University to access business support with university students, which has been our best input so far on documenting and improving our processes. This is going to allow our business to really scale, which would not have been possible before. I have been on a huge learning curve and learning for the past 2 years on how to run a business, which is totally different to just having a job, it has taken me a while to get to grips with this, but the journey has been amazing, so much so, I am now in the process of writing my own book, which should be ready to be published by the end of 2018, which is quite exciting and has all been helped by NBV and their support. My plan is to grow an accountancy practice that can become the largest and best accountancy practice in the UK. We will utilize UK-based accountants to outsource a majority of the work to give a very lean business that can expand and grow; we aim to become the Fiverr for the accountancy world. What have been the highs and lows of starting your own business? The best thing about being a business owner is the freedom to create whatever you want and be in control of your own destiny and create your own dream. The lowest point was last year when we made a loss which was a planned loss but it was worse than we expected. For what had been a very successful business year it was a bitter pill to swallow. A lot of businesses make a loss though, and it is understanding what went wrong and turning that around that makes it a challenge. It has been an amazing journey, very difficult but amazing. What advice can you offer for anyone thinking of setting up their own business? My advice to anyone setting up a business is to get help from the outset and study how to run a business before doing it. Most business owners I meet are technicians and they are very good at doing the work but are just no good at running a business, because they try to do everything. Get a good accountant, get a good coach, access as many free webinars as possible, and read lots and lots, but once you are set on setting up a business be very clear as to how you intend to serve your ideal customers and be clear what your business is going to look like. This will help you shape the future for your business and will be a great tool to look back on and help make decisions based on your vision for the future. It will be tough and it will feel like it is impossible at times but hang on for the journey and play the long game. It will all come together if you work ON your business and not IN your business.